Steam cooking highlights the delicate sweetness of scallops without the extra calories from butter or oil that is typical of seared or fried scallops. While steaming is one of the easiest and quickest ways to prepare scallops, it's also easy to overcook the scallops, making them flavorless and rubbery. Time adjustments must be made depending on the size of the scallops -- sea scallops are roughly 1-1/2 inches in diameter, while bay scallops average about 3/4 inch. Steamed scallops are well-suited for Asian-inspired dishes or as served in a salad or pasta dish. Bring the base pot of a steamer to a low boil over medium-low heat. Add a steamer basket to the base pot. The level of the water should be about 1 inch below the level of the steamer basket when added to the base pot. Pull the tough muscle off the sides of the scallops with your fingers. This is a rectangular piece of meat that feels much tougher than the rest of the scallop meat. Place the scallops in a mixing bowl and toss with your choice of seasonings and spices, if desired. 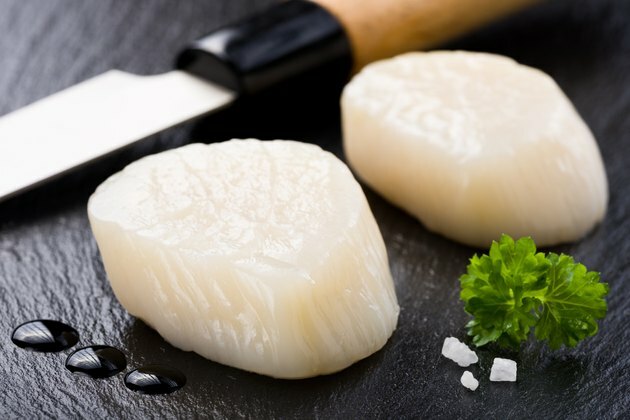 While you can steam the scallops plain, you can also sprinkle them lightly with salt, toss them in lemon juice for a light citrus flavor or toss them with ingredients such as soy sauce and honey for an Asian-inspired meal. Place the scallops in the steamer basket. Cover with a tight-fitting lid. Steam the scallops for roughly 3 to 8 minutes, depending on the size and number of scallops. Small calico scallops only take a few minutes to cook, while large sea scallops can take up to 8 minutes. Scallops are done when they are white, opaque and firm, but with a slightly springy center. Scallops are typically patted dry with paper towels when seared or breaded and fried, but this isn't necessary for steamed scallops. Do not rinse the scallops before cooking; this results in flavor loss.